Penguins are birds but they are not able to fly. They spend most of their time underwater looking for food like krill, fish, squid and other small sea animals. There is a hook at the end of a penguin’s beak which is perfect for grabbing food. They also have backward facing hairs on their tongues that stop slippery food from getting away! Penguins which eat fish, for example the Emperor Penguins, have longer and thinner beaks. Penguins that eat krill, like the Macaroni penguins, have shorter and thicker beaks. Penguins do not have teeth. They can drink salty sea water because they have special glands in their body to take the salt out of their bloodstream. People don’t have glands like these – if we drink sea water the salt makes us thirstier and thirstier until we die. When penguins are in the water, they can move around extremely quickly. They use their wings as flippers. So, when they are in the water, they flap their wings as if they are flying in the air. Penguins are found mainly in the southern hemisphere, especially Antarctica. There are almost no wild penguins in the northern hemisphere. There are several types of penguins who enjoy a temperate climate, and even one species (the Galapagos Penguin) that lives in the tropics. 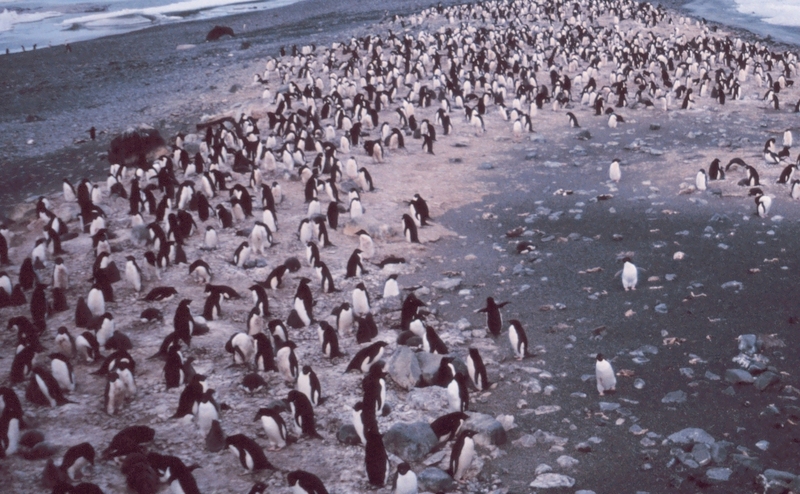 Big populations of penguins are found in Antarctica, Australia, New Zealand, South America and South Africa. There are actually only 17 species of penguin in the world. The biggest living penguin, the Emperor Penguin is the only species that breeds and nests in the Antarctica. An adult Emperor Penguin can stand about 1.1 metre (3 feet 7 in) tall and weighs about 35kg (75lb) or more. The smallest penguin species is the Little Blue Penguin also known as the Fairy Penguin which is about 40cm (16in) tall and weighs about 1 kg (2.2lb). The biggest penguin ever was the giant penguin called Anthropornis. It was as big as a human! In fact, it’s name means “man-bird.” Can you imagine yourself meeting such a huge penguin face to face? It was about 1.7 metre (5 ft 7 in) tall and 90kg (200 lb) in weight. Penguins have dark and white layers of feathers covering their bodies which protect them from being seen by their predators as they swim. When a predator like a leopard seal looks up from below, it will have trouble seeing the white penguin belly against the bright water surface. If it looks down from above, the dark penguin’s back will be hard to see against the gloomy ocean depths. Therefore, to stay safe, penguins have to wear their black and white tuxedo suit wherever they go – and be sure to never swim upside-down! 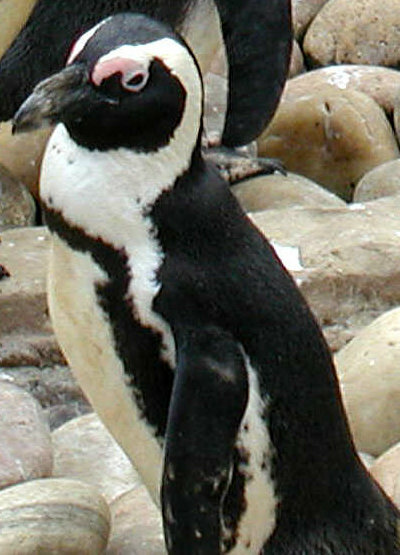 Within the smooth layers of feathers, there is a layer of air which helps the penguins to be able to float in the sea. The air layer also insulates the penguins in cold waters. Apart from that they have torpedo shaped bodies which made them swim really well. They can reach 6 to 12 km per hour (3.7 to 7.5 miles per hour). On land, penguins use their tails and wings to balance themselves when they stand upright. Small penguins do not usually dive deep. They catch their prey near the surface of the sea. Larger penguins can dive deep into the ocean. The Emperor Penguin can dive to a depth of 560 metres (1870 feet) for up to 22 minutes. Penguins cannot breathe underwater, but they hold their breath for quite a while, especially the Emperor Penguins. They will sometimes jump out of the water and get a big gulp of air before diving back down to the sea to look for food. On land, penguins will either walk with tiny steps, swaying clumsily from side to side on their short feet, or slide on their bellies across the snow. Wouldn’t that be fun! In fact, sliding on their bellies helps them to save energy and move quickly. They jump when they want to move faster or cross steep or rocky cliffs. They can jump 5 feet (1.5 metres). They have very short feet which they use for steering in the water when they swim. All penguins have webbed feet like ducks to help them to swim. Penguins are warm blooded, just like us. They also have a layer of fat just under their skin like a seal to keep them warm and cosy. Penguins rub oil from their bodies onto their feathers to help keep them waterproof and windproof. They can also control the flow of blood to the surface of their bodies, in order to reduce the amount of blood that gets cold and causing the outer bodies to freeze. They often huddle together to keep warm and regularly swap positions to make sure that each penguin gets a turn in the center of the heat pack. 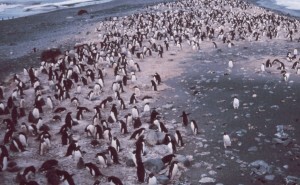 As many as 5000 penguins will huddle together to warm each other. The Galapagos penguins have a totally different story to tell because they live in the tropics, which are hot. They will not huddle each other to keep warm. They will instead spread out their wings and fluff out their feathers to keep cool instead. Penguin have no external ears. They hear through two small holes which are located at the same place as our ears. These holes are covered with feathers. They have an average sense of hearing for birds. Penguins locate each other with their calls. They breed in large colonies. These colonies may range in size from as few as 100 pairs for Gentoo Penguins to several hundred thousand pairs for Macaroni Penguins. Once a penguin finds a mate, they usually stay together for years. Most penguins lay two eggs in a nest. The larger species like the Emperor Penguins and the King Penguins will lay only one egg. All penguins share the work of keeping their eggs warm except for the Emperor Penguin, where the father keeps the egg warm until it hatches. The mother will go and look for food. Penguins’ eggs are smaller than other birds’ eggs. The eggs have thick shells. When the chick hatches, it immediately start calling so that its parents will be able to recognize it in the midst of the huge colony. If a mother happens to lose a chick, she will sometimes try to steal another mother’s chick, but will normally fail because the other mother is watching over her own chick. Once the chick is big and strong enough, mum and dad will head to the sea to look for food at the same instead of taking turns to look for food. The chicks are left in a large group called a creche. When the penguin parents return with food, they will recognize their chick by its voice. They do not seem to be afraid of humans. This is probably because penguins have no land predators in Antarctica or the nearby offshore islands. They have predators at sea, for example, the leopard seal and orcas. However, visitors to the places penguins live are advised not to go too close to the penguins, in case they get too nervous. The french word for the english “penguin” is “manchot” (and not pengouin)!! The French word “pengouin” designates a type of auk, a bird that can fly and lives in the northern hemisphere.